Did you know that you can download and watch the Freakonomics movie right now? The theatrical release is October 1 for limited screenings and November 1 for widespread distribution, but why wait? 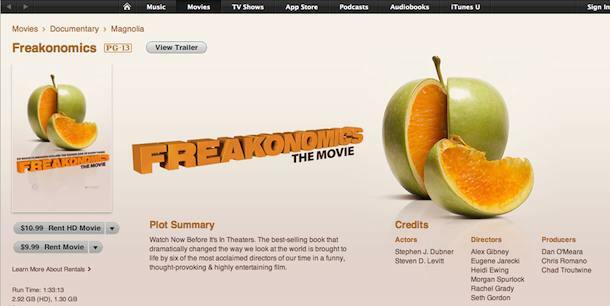 All you need to do is jump on the iTunes Store and you can download and watch Freakonomics right now. The HD rental is $10.99 or $9.99 for standard def, considering it’s a pre-release movie and cheaper than a movie date anyway that’s not too shabby. In case you don’t know, this is a documentary based on the book Freakonomics which came out a few years ago and explores some interesting relationships and links between seemingly unrelated events and trends. I read the book a while ago and didn’t find any of the data particularly ‘freaky’ but it certainly was a fascinating read, the documentary looks to be just as interesting. Having pre-release movies available for online rental with iTunes seems to be a new trend that the movie industry is exploring, and one I am certainly not complaining about. How cool is it to watch movies before they’re even in the theaters and in the comfort of your own home? Of course you could also get it on your iPad or iPhone, but I say fire up that Mac Mini media center and start watching!